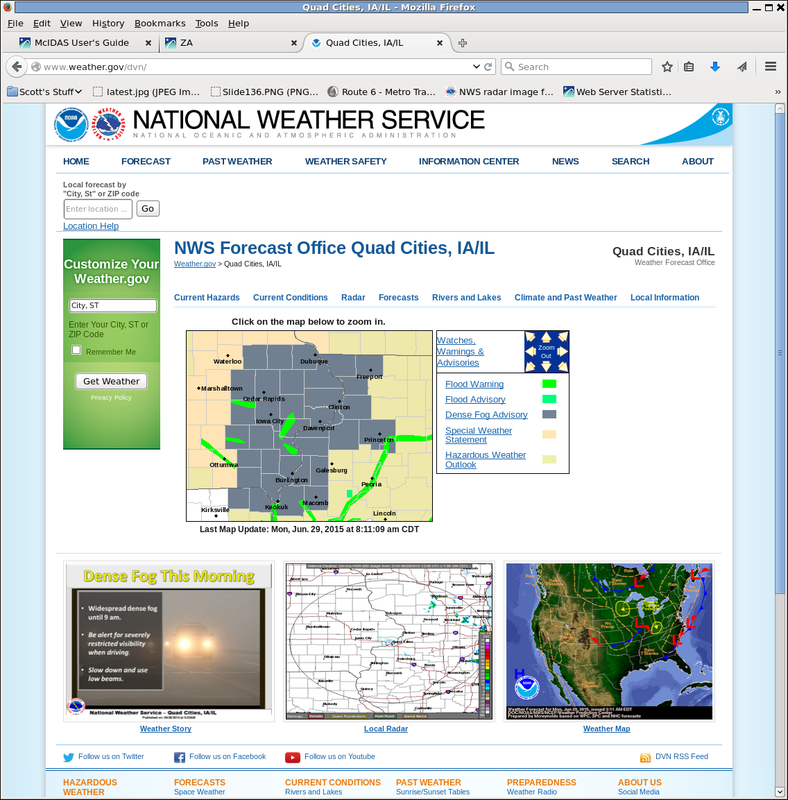 Dense fog developed over the mid-Mississippi Valley early on Monday, 29 June 2015, and Dense Fog Advisories were hoisted by the DVN WFO, as shown above. How did the GOES-IFR Probabilities (and other products) capture this event? The animation below shows the evolution of surface visibilities at 0600, 0800 and 1000 UTC. IFR Conditions have developed by 0600 UTC and they subsequently expand. The Day Night band suggests clouds are present over parts of Iowa at 0707 UTC, but the waxing gibbous moon has set by 0848 UTC (below), and the lack of reflected moonlight at the later time precludes cloud detection. The brightness temperature difference (11.45µm – 3.74µm) from Suomi NPP can detect the tops water-based low clouds and it does confirm that the clouds have not vanished at 0848 UTC despite the lack of signal in the Day Night band. The brightness temperature difference field includes signals (black in the enhancement used) that suggest the presence of cirrus clouds. MODIS data can be used to compute IFR Probability fields. These fields are not available frequently, although they do present a high-resolution view of events when available. Two overpasses, at 0408 (Terra) and 0817 (Aqua), provided imagery early on 29 June. The MODIS data suggests the development of a large area of fog. What does GOES data show? Click here for a comparison of MODIS and GOES at 0408 UTC, and here for a comparison of MODIS and GOES at 0817 UTC). The chief difference between MODIS and GOES is somewhat higher values at the earlier time, and sharper edges (as might be expected given the resolution differences) at both times. GOES-R IFR Probabilities computed from GOES-13 have a temporal resolution that allows for monitoring of fog development, and values increase rapidly after 0500 UTC over eastern Iowa, in accord with the development of IFR observations shown above. Brightness Temperature Difference fields (bottom) also suggest the development of low clouds over Iowa. However, there are places where high clouds prevent a signal and the rising sun (and its 3.9 µm radiation) mean the signal is reduced at the end of the animation. GOES-R IFR Probabilities maintain a coherent signal through sunrise. This entry was posted in Midwest, MODIS, Suomi/NPP on June 29, 2015 by Scott Lindstrom. 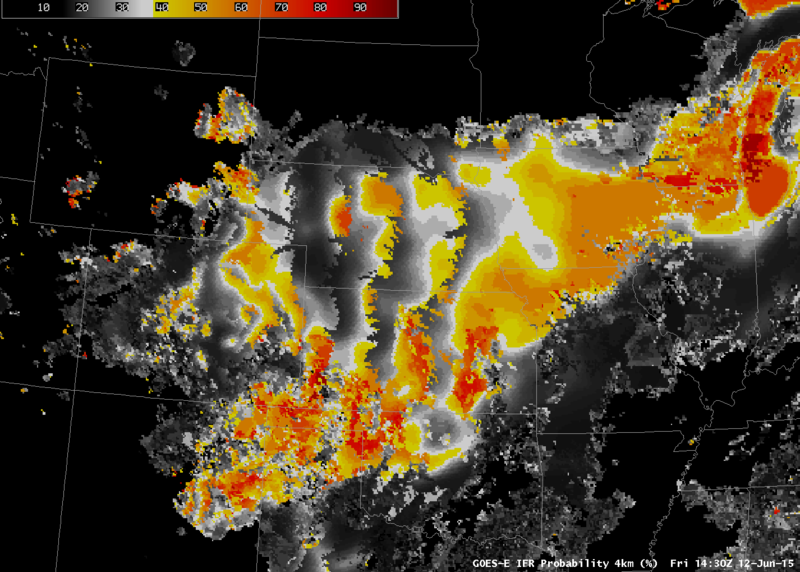 GOES-R IFR Probability fields over the Plains can sometimes include structures as shown above. These are related to the sloped topography of the Great Plains. They occur because of interpolation between model layers and the lowest 1000 feet that are examined for saturation. In a sloping region, quick changes in saturation amount can occur where changing topography changes which model levels are used in the examination of those lowest 1000 feet. In other words, satellite pixels that are very close horizontally may nevertheless have different surface elevations that cause different profile levels to be analyzed for the maximum relative humidity (RH). If the RH drastically changes at the bottom or top of the profile being analyzed then differences will emerge as shown above. Extra interpolation before the profile is analyzed may mitigate this issue and could be incorporated into the algorithm in the future. This entry was posted in Error Explanations on June 28, 2015 by Scott Lindstrom. IFR Probabilities are derived from GOES-15 brightness temperature difference fields, and a benefit of the IFR Probabilities is obvious above. Brightness Temperature Differences can be driven by emissivity differences in soil. These false positives over Nevada (from the point of view of fog detection) are easily removed if the Model Data does not show low-level saturation. Suomi/NPP’s early morning overpass also detected the presence of fog/low stratus over the valleys along the northern California coast. The Brightness Temperature Difference field shows things distinctly. The Day-Night Visible imagery shows little in the way of fog on this day, as the waxing crescent moon had already set so no lunar illumination was present. The Day Night band is included here because it shows a very bright wildfire south of Lake Tahoe. That feature is also present in the 3.74 µm imagery. Fog and stratus is also evident in the 3.74 µm imagery, detectable based on its very smooth appearance. This entry was posted in California, Day/Night Band, MODIS, Suomi/NPP on June 22, 2015 by Scott Lindstrom. Sea fog penetrated inland over eastern New England overnight. How did GOES-R IFR Probabilities depict the event, and how did those fields compare to the traditional fog-detection method, brightness temperature differences between the 10.7 µm and 3.9 µm channels? The animation above shows the IFR Probabilities, and they neatly outline the regions of low ceilings and reduced visibilities. In contrast, Brightness Temperature Difference fields, shown below, are troubled by two different factors in these loops. Around 0700-0800 UTC, thin cirrus over southern Cape Cod impedes the satellite view of low clouds (Click here for a toggle between the two fields at 0722 UTC); brightness temperature difference fields yield little information when that happens. (GOES-R IFR Probability values drop when the Satellite component cannot be used; make certain when interpreting the values that you are aware of the presence/absence of high clouds!) In addition, the brightness temperature difference field loses features around sunrise, when solar radiation with a wavelength around 3.9 µm increases. GOES-R IFR Probability fields maintain a coherent signal through sunrise, however. Careful inspection of the animation above does reveal some stations where IFR Conditions occur and IFR Probabilities are low. For example, Lebanon NH in the Connecticut River Valley reports IFR Conditions intermittently. Small-scale valley fog is a challenge for both GOES detection and for Rapid Refresh detection. This entry was posted in New England on June 22, 2015 by Scott Lindstrom. A cold front that moved across Maine early in the morning on 10 June 2015 was accompanied by dense fog. Dense Fog Advisories were hoisted over eastern Maine (screenshot from weather.gov; screenshot from the Caribou ME National Weather Service). The hourly imagery of IFR Probabilities, above, showed high probabilities over eastern Maine (where surface observations are scant). Note how the back edge of the high IFR Probabilities, after the frontal passage, correlates will with the timing of rising ceilings and reduced visibilities. This occurs at Augusta (KAUG), Bangor (KBGR) and Millinocket (KMLT), for example. The traditional method of detecting fog and low cloud, the brightness temperature difference field that compares values at 10.7 µm and 3.9 µm , had difficulty indicating regions of fog for two reasons on the morning of 10 June. An animation of the product is below. There were high clouds present that interfered with the satellite’s view of low clouds. (IFR Probability can still give a useful signal in this case because of information that comes from the Rapid Refresh Model). In addition, the ever-earlier sunrise in early June supplies enough 3.9 µm radiation at the end of the animation to flip the sign of the brightness temperature difference field and the distinct signal of low water-based clouds is lost. This entry was posted in New England on June 10, 2015 by Scott Lindstrom. By 0915 UTC (above), IFR Probabilities and GOES-13 Brightness Temperature Difference fields show a strong signal over NE Colorado where IFR Conditions occur/are developing. IFR Probability fields have provided more lead-time in the development of this region of low ceilings and visibilities. By 1100 UTC (below), a stronger, more widespread signal is apparent in both fields. At 1230 UTC (bottom), the rising sun has altered the brightness temperature field so it gives no useful information on low clouds; this highlights an advantage of GOES-R IFR Probability fields: A consistent signal through sunrise. This entry was posted in Plains, Rocky Mountains on June 1, 2015 by Scott Lindstrom.